Home / Uncategorized / Ducks and Boats? As part of the euphoria that is part of winning a Three Star Gold in the Great Taste Awards, we felt that we needed a small display sign to give to our wonderful retailers to help them let their customers know about our Smoked Silver Hill Duck. So a quick Skype call to Nevil Swinchatt, our graphic designer now based in Cornwall, with a simple request to produce something by lunchtime. So delighted were we with the image, that we thought we really should introduce Nevil to you because not only is he a very good graphic designer but he is also a painter! One of his clients is the famed yacht designer, Ron Holland, and here is one of Nevil’s paintings of the Thalia. Have a look at Nevil’s website, www.nevils.co.uk to see more of his work and to download a press release about his painting of Thalia. Previous post: Gold! Gold! Gold! Next post: Change – seems to be the buzz word in Ireland! Hi Anthony. 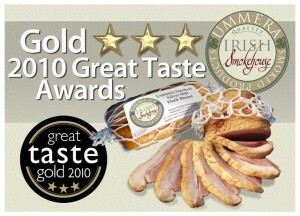 Congrats on the Best Irish Speciality award too. We asked for seconds of the smoked duck around the final judging table. That mention of Nevil Swinchatt is useful – we often get folks phoning the Guild of Fine Food looking for the names of designers that are not full-on London agencies. A good lead – thanks. Smoked duck breast, Irish smoked salmon plus other wonderful tasties including sparking wine arrived as a gift just before Christmas. The duck, salmon and sparkling (non-alcoholic), great tastes and quality. Must indulge myself again soon via Ummera. Thank you. Delighted to hear that you enjoyed our smoked products and that the sparkling wine (even being non-alcoholic!) complemented your feast! Look forward to helping you indulge yourself before too long!